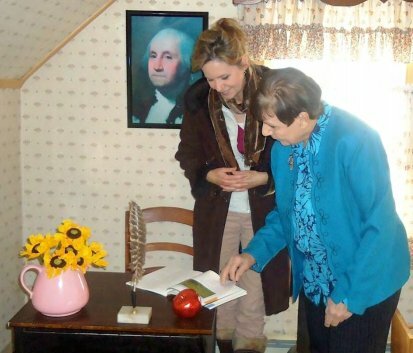 Rocky Point Historical Society President Natalie Aurucci-Stiefel showed Legislator Anker the “school room” at the Hallock Homestead. Rocky Point, NY - January 15, 2014 - On Monday, January 13th, Legislator Sarah Anker joined Natalie Aurruci-Stiefel, Rocky Point Historical Society President, for a tour of the Noah Hallock Homestead in Rocky Point. Built in 1721, the home was saved last year through the generosity of community supporters, as well as a county grant sponsored by Legislator Anker. Home to seven generations of the Hallock Family, the house is now maintained by the Rocky Point Historical Society and serves as a museum for visitors to view clothing, farming tools and artifacts from the Hallock family, and discover the history of Rocky Point. Aurucci-Stiefel says that the Historical Society hopes to provide field trip programs and host a gallery to showcase local artwork. Legislator Anker was able to secure $5,000 in the Suffolk County 2014 Operating Budget to support the Rocky Point Historical Society, which will assist the organization in the preservation of local history. For more information about the organization, visit www.rockypointhistoricalsociety.org. Subject: LongIsland.com - Your Name sent you Article details of "Legislator Anker: Supporting the Preservation of Local History"